Thanks to your mother, Gaia, you managed to get free and gather enough strength to create an ideal world on the opposite side of the cosmos. Still weak, and with little time at your disposal, you hope to prove your wisdom to your father. But beware of his anger and of your brothers: The Cyclops and the Hekatonkheires! 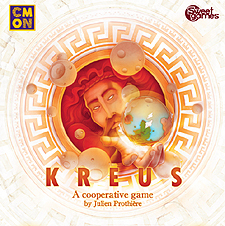 Kreus is a cooperative game. Four levels of difficulty offer a variety of challenges. In order to create the perfect planet you will have to ponder together, communicate subtly and trust each other. Follow your instincts and remember: Together, you go further!